The ancient ecclesiastical edifices of a city are generally the first objects to which strangers direct their attention. In Dublin, the venerable CATHEDRAL OF ST. PATRICK claims precedence on account of its extent, importance, and high antiquity. 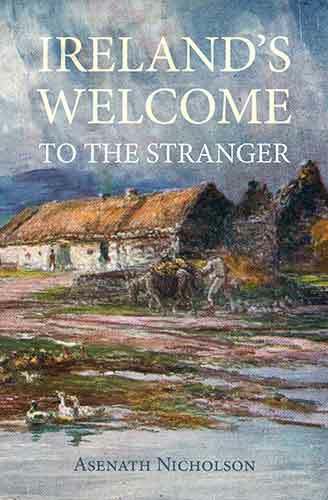 Its situation, however, is most objectionable, being built on the lowest ground in the city, and surrounded on every side with old narrow streets, of the meanest and filthiest description. The reason for selecting such an unfavourable site for the principal cathedral was the peculiar sanctity of the place, for on this spot, according to the best authorities, stood a small church, which it is supposed, with every appearance of probability, was founded by native converts to Christianity long before the Danes acquired possession of the city, as it was dedicated to the apostle of Ireland, and was erected in the vicinity of a holy well, also dedicated to St. Patrick. 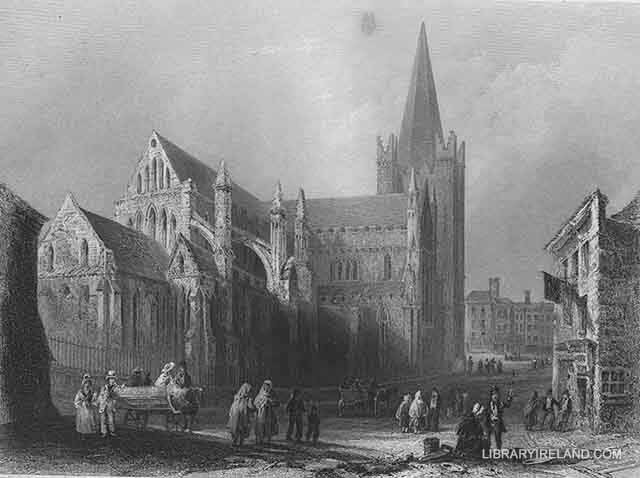 John Comyn, the first archbishop of Dublin, pulled down the ancient church, and erected on the same place a more extensive structure, in which he placed a collegiate establishment. Henry de Loundres, the successor of this prelate, made it a cathedral in 1225, uniting it with the priory of the Holy Trinity, or Christ Church, and securing to the latter the prerogative of honour. The architectural character of the pile is of the early pointed style, with some occasional innovations in the additions which have been made at various periods. The most remarkable of these supplementary portions of the edifice are the square steeple and spire; the former owes its erection to Archbishop Minot, in 1370, and the latter to a legacy bequeathed by Dr. Sterne, in 1750. This spire has been compared, not unaptly, to a vast extinguisher. The height of the steeple or tower is one hundred and twenty feet, that of the spire by which it is surmounted, one hundred and one feet, making a total of two hundred and twenty-one feet. Notwithstanding this elevation is very considerable, the structure is far from possessing that grandeur of appearance one might expect; this is owing partly to the low situation in which it stands, and in a great degree to the clumsiness of its proportions, for it is only by comparing it with the buildings in its neighbourhood that we can form an idea of its great height. The interior of the cathedral is somewhat gloomy and monotonous, being built in the simple style which marks the first regular structures in this species of architecture. The nave is separated from its aides by unadorned arches and octangular pillars. The choir is the most interesting portion of the interior; the arches, which divide the centre from the side aisles, spring from clustered columns, each component shaft of which terminates in a small capital composed of foliage. The archbishop's throne, which is of oak richly carved; the stalls of the knights of St. Patrick, over each of which are displayed the banner, helmet, and sword of the knight; the tall lancet-shaped windows, the fine altar-piece, and the magnificent organ placed in the screen that divides the nave and the choir, form a combination of objects which irresistibly recall the mind to the times when religion and chivalry mingled their solemn and gorgeous pageants. The cathedral contains several monumental sculptures, more remarkable for the celebrity of the names they commemorate than for the excellence of their design or execution. Amongst them the stranger will pause with interest before the black marble slab, which bears the name of Jonathan Swift, dean of this cathedral, whose wit and public spirit need no encomium here. Near to the remains of the eccentric dean lie the ashes of Mrs. Johnson, celebrated by his muse under the name of "Stella;" the history of this lady, and the nature of her connexion with Swift, are still involved in a mystery that there is no probability will be ever satisfactorily cleared up. The most conspicuous and elaborate, but at the same time the most tasteless monument in this part of the church, is that on the right of the altar, intended to perpetuate the memory of sixteen individuals of the family of Boyle Earl of Cork. It was erected by Richard "the Great Earl," in the reign of Charles I , and remains a huge memorial of the gaudy and tasteless style which prevailed at the period of its erection. On the opposite side of the choir is a mural tablet in black marble, to the memory of Frederick Duke of Schomberg, the celebrated general of William III., who was killed at the battle of the Boyne. The ashes of this brave man were suffered to remain without any monumental record until Dean Swift erected the simple tablet above mentioned at his own cost. Mr. Brewer says that "Swift did not undertake his task until he had made repeated unsuccessful applications to the family, who derived the whole of its affluence and honours from the duke; and the indignant severity with which he composed the inscription on a tablet thus raised by alien hands, although it gave some offence at the time, redounds to the honour of his humanity and public spirit." This cathedral, which, had fallen into a lamentable state of decay, has been recently rebuilt according to its original design, and is now likely to stand for many ages a fine specimen of the early architecture of Ireland.